Ok, so here's my second review of a Newburgh Brewing Company beer. Like I've said, I love what Chris comes up with at the Brewery, and you can taste his attention to detail in every batch you taste. This review is of their Unkel Dunkel, which is a Dunkelweizen style of brew. Dunkelweizens are German Wheat beers, however, unlike the hefeweizen the Dunkel is a darker version of the typical German wheat beer. (The word "dunkel" meaning "dark"). Packaging: Draft at the tap room. Appearance: Very dark brown, black coffee appearance. A nice 1-2 finger thick creamy taupe colored head. Decent amount of carbonation can be seen sticking to the glass. Also, a decent lacing at the top of the head that sticks to the glass as the head dissapears. Aroma: A lot of sweet, malty aromas come off on the nose at first, followed by banana notes and chocolate notes. Also getting some chocolate notes and roasted coffee as well. Taste/Mouthfeel: Generous amounts of carbonation on this one give it an "airy" feel to your mouth. On the first sip banana bread, carmalized malt and chocolate notes seem to prevail, followed by slightly bitter chocolate notes on the back end. The beer seems to get sweeter with subsequent sips, giving way to banana notes, and banana bread notes. As you continue, the banana bread notes mingle with the chocolate on the back end, and there's always that bitter chocolate bite on the finish. 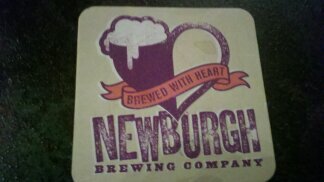 Overall: Another outstanding traditional session beer from Newburgh Brewing Company. These guys kill it with their devotion to traditional session beers, and they do it so damn well. This is an excellent example of a dunkel, and houses all of the complexities you would expect from a German brewery. Definitely another one of my favorites from Newburgh! Cheers fellas! Newburgh Brewing Company's "Sterk Ale Von Hoodie"